We’d love your help. Let us know what’s wrong with this preview of The Stainless Steel Rat's Revenge by Harry Harrison. To ask other readers questions about The Stainless Steel Rat's Revenge, please sign up. James Bolivar DiGriz (aka the Stainless Steel Rat) is my newest literary comfort food. After reading this, I even created a “comfort food” bookshelf because I found it such a mood-enhancing piece of toe-tapping terrific. Granted, there are a lot of morally casual rogue types surfing the SF space ways, but Harry Harrison has made Slippery Jim something very warm and cuddly. He is a cup of hot chocolate and a pair of UGG slippers wrapped in a soft blanket in front of a fire on a chilly evening. He James Bolivar DiGriz (aka the Stainless Steel Rat) is my newest literary comfort food. After reading this, I even created a “comfort food” bookshelf because I found it such a mood-enhancing piece of toe-tapping terrific. Granted, there are a lot of morally casual rogue types surfing the SF space ways, but Harry Harrison has made Slippery Jim something very warm and cuddly. He is a cup of hot chocolate and a pair of UGG slippers wrapped in a soft blanket in front of a fire on a chilly evening. He is FEEL GOODNESS itself. Why? A number of reasons but two I found most important. First is the gliding, easy breezy style of Harry Harrison’s writing that he infuses with real quality (a tough balance). This is light-hearted fun with depth. Second, and related to the first, is the intelligence and detail that Harrison brings to the plot. Despite being designed as a smiling-inducing space adventure, Harrison provides enough explanation for DiGriz’s larger than life accomplishments to preserve the disbelief suspension so that the reader never feels like their smarts are being given the finger. Harrison makes you feel “taken care of” by his stories. That is something I found really special. For those new to the series, James DiGriz was the galaxy’s most accomplished, most sarcastic thief and most wanted thief. Smart, suave and skilled in the art of disguise and wholesale dishonesty, he's also a master at breaking and entering and numerous forms of hand to hand combat. He is saucy sack of SCOUNDRELific. Things got real interesting when Slippery Jim was “out-conned” into joining the Special Core, an elite police force and spy agency made up of former criminals. The Special Core is headed by Harold P. Inskipp (aka Inskipp the Uncatchable) who was the most famous thief in the galaxy in his day. The Special Core's mandate is to hunt down the most violent criminals and run certain covert ops for the government when their particular skill sets are needed. Jim and Angelina, his pregnant wife and former criminal mastermind, are off honeymooning and doing a little bank-robbing for shits and giggles (they maybe Special Core, but they are still roguishly roguey). Of course, Jim would say he is just giving the police force a bit of excitement in their otherwise dreary lives. Well Cliaand has found a way to do it successfully and are beginning to expand at a dangerous rate. DiGriz is sent to find out how they are doing it and discover a way to stop them. The details of his mission and how he gets around the INTENSE security of the police state like Cliaand government is simply barrels of monkey fun. I had such a good time with this story that I feel like I want to go back and read the first one because I only gave it 3 stars and that feels a bit criminal at the moment. This is the kind of story that you can pick up time and time again and just enjoy. DiGriz is the perfect rogue with mad skills and a heart of gold. Think Han Solo with spy craft and sans wookie (though Angelina is ONE SERIOUSLY TOUGH HOMBRE). I plan to slowly read through the rest of the stories as well as Harrison’s other work as he has really impressed me with his story-telling so far. If you are looking for a light-hearted, but smartly written and well plotted feel good story, this certainly fits the bill. 5.0 stars. HIGHEST POSSIBLE RECOMMENDATION!!! Slippery Jim diGriz returns in the second of Harry Harrison's light-hearted science fiction series – The Stainless Steel Rat. Having stopped Angelina's homicidal scheme in the first novel, The Stainless Steel Rat , our hero promptly falls in love with her. Luckily, the technology of the Special Corps means that part of Angelina's punishment is that the homicidal parts of her brain are reprogrammed. Although, still trouble with a capital 'T', she no longer wants to kill people. Which is lucky as Slippery Jim diGriz returns in the second of Harry Harrison's light-hearted science fiction series – The Stainless Steel Rat. Having stopped Angelina's homicidal scheme in the first novel, The Stainless Steel Rat , our hero promptly falls in love with her. Luckily, the technology of the Special Corps means that part of Angelina's punishment is that the homicidal parts of her brain are reprogrammed. Although, still trouble with a capital 'T', she no longer wants to kill people. Which is lucky as she's pregnant with their child and married in fairly short order from the start. Having skipped out on the Special Corps, they're holidaying in secret while robbing banks to pass the time together. Tracked down again by Special Corps diGriz is offered the opportunity to redeem himself again through a dangerous mission to investigate a secretive planet which has been invading a number of nearby planets and starting to worry the corps. We're told that invading a planet is supposed to be nigh-on impossible. Planets are too easy to defend, too hard for an attacker to maintain control of. Presumably a bit like the idea, that we in the UK have held on to, that our island status makes us harder to invade – although the long history of us successfully invading smaller islands suggests it's actually far from impossible if you choose islands that are both small enough and significantly less technologically advanced to ensure a rout. Part investigating how the Cliaandians are managing to, repeatedly, successfully invade other planets; part trying to get in on the action and somehow stop them in their attempt to take over the matriarchal planet of Burada. Not long after finishing the first book in the series, I happened to stumble upon the sequel and happily picked it up. After how much I enjoyed the first book, I expected more great things from this. While it was still good fun, I didn't quite enjoy it as much as the first, and it did feel a bit more dated this time. If I see the next book I might pick it up, should I be in the mood for something light, but for now I'm quite happy to leave it there. Warning: Don’t read this review if you haven’t read the first Stainless Steel Rat novel. Several nights ago I was in a bad mood. I had asked my husband to pick up M&M’s while he was at the grocery store because my daughter needed them for a school party the next morning. Due to a bad cell phone connection, he came home with the wrong thing and I didn’t discover this until 11 pm, after the closest grocery store was closed. Grumbling and feeling sorry for ORIGINALLY POSTED AT Fantasy Literature. Several nights ago I was in a bad mood. I had asked my husband to pick up M&M’s while he was at the grocery store because my daughter needed them for a school party the next morning. Due to a bad cell phone connection, he came home with the wrong thing and I didn’t discover this until 11 pm, after the closest grocery store was closed. Grumbling and feeling sorry for myself, I got into my car and set out searching for M&Ms. Fortunately, I had grabbed an audiobook on my way out the door: The Stainless Steel Rat’s Revenge by Harry Harrison (produced by Brilliance Audio). Within 2 minutes of hitting play, I was smiling and laughing out loud — a complete mood reversal. It’s not just the despicably charming characters of Slippery Jim DiGriz and used-to-be-evil Angelina, but also Phil Gigante’s hilarious delivery. The Stainless Steel Rat’s Revenge begins with Slippery Jim robbing a bank and Angelina driving the getaway car. Jim is as clever and ingenious as ever, but now he’s joined by Angelina — the evil villainess from the first novel who’s supposedly been “fixed” and is now working with Jim for the Special Corps, though they’ve both escaped and are attempting to return to lives of crime together. Angelina hasn’t lost any of her skills and ambition — she just has a bit of human decency now. Fortunately for the reader, not enough decency that she isn’t eager to go along on Jim’s crime sprees and help him out of tight spots, even while pregnant. This combination of Angelina’s brilliant criminal activity, deadly fighting skills, and sweet wifely and motherly instincts is absurdly amusing. And we’re never quite sure if she’s really cured of her sociopathic tendencies… Phil Gigante gets her voice just right. Jim and Angelina end up turning themselves in and Jim gets sent on a dangerous assignment in which he must figure out how the planet Cliaand is conquering other planets. Along the way, he goes undercover as a Cliaand officer (Gigante’s Russian accents are so funny here), meets an army of beautiful women, wears transparent clothes, undergoes psychoanalysis (Gigante’s got a German accent here), and creates a troop of polite robot butlers who, in Gigante’s uppercrust English accent, say things like “Thanking you, Sir” as they throw bombs at the enemy. This story takes off a few months after the end of the first book, "The Stainless Steel Rat". It follows James Bolivar diGriz, who is a con-man employed by a special agency aimed at defeating serious crime and other bad things, in this case, galactic conquest. I enjoy the way these stories unfold, and I like the glee with which the narrator (audio book) provides as he tells certain events. I wonder if these stories inspired Richard K. Morgan in some ways. Takeshi, from Morgan's books, has a numbe This story takes off a few months after the end of the first book, "The Stainless Steel Rat". It follows James Bolivar diGriz, who is a con-man employed by a special agency aimed at defeating serious crime and other bad things, in this case, galactic conquest. I enjoy the way these stories unfold, and I like the glee with which the narrator (audio book) provides as he tells certain events. I wonder if these stories inspired Richard K. Morgan in some ways. Takeshi, from Morgan's books, has a number of similarities to James, but I like James better since he has a conscience. Sure, he'll steal, but he takes no pleasure in killing. In both cases, you have an adept criminal who is a member of an elite government agency aimed at taking care of significant problems. Of course this idea probably predates Harry Harrison's books, too. There's some twee fun to be had here, a bouncy enough romp through spiking an interstellar invasion, but mainly it was just ok. It's the kind of book I'd suggest for my future children, except I wouldn't want them to think every woman is a buxom amazonian, fiercely independent up until the point where Jim capitulates, whereupon they melt again. He's definitely a rat. Reconstruct please. Jim DeGris throws lots of smoke grenades, changes his appearance many times, and sneaks in then out then in again to get the bad guys. This easy to read science fiction book does not challenge the reader at all but is still kind of fun. The Rat, fresh from marrying his homicidal sweetheart Angelina, is sent to the oppressive planet Cliaand to investigate why they are invading other planets. This is probably the novel that sets the formula for all the other novels in Tis sequence. It is fast, madcap, full of ridiculous capers and adventures and full of Jim's trademark larceny and sheer genius at improvisation. The sequence where he breaks out of the military base then breaks back in again is superb. It fleshes out the ideas and The Rat, fresh from marrying his homicidal sweetheart Angelina, is sent to the oppressive planet Cliaand to investigate why they are invading other planets. It fleshes out the ideas and universe of the first book much more realistically and also gives the female characters much more to do: we see what Angelina is capable of this time around, and there's a reason why she and Jim are among my favourite spouse teams in fiction. The only issues with this book are that it does try to produce some credible female supporting characters but doesn't really do much with them beyond plotting. The science feels a little less specific and, therefore, much less dated (hint to SF writers: Te more detail you put into your tech, the faster it dates), although it's easy to tell that this was a novel written before the ascendancy of software over hardware in technology. Slippery Jim Di Griz gets married to Angelina and then has to stop a planet from invading other planets. Jim tries to infiltrate the regime and do some spy work, and ends up getting rescued by Angelina and then they both have a lot of fun saving the world(s) from the bad guys. I was a big fan of this series of books as a teenager, but since then I've changed, and the books, well they've dated reasonably well. Harry Harrison knows his audience, but it's very narrow, and the humour fades after a wh Slippery Jim Di Griz gets married to Angelina and then has to stop a planet from invading other planets. Jim tries to infiltrate the regime and do some spy work, and ends up getting rescued by Angelina and then they both have a lot of fun saving the world(s) from the bad guys. I didn't enjoy this stainless steel rat adventure nearly as much as the first. The scenes often seem disjointed without sufficiently building on what came before, and there are a few giant leaps in which problems are suddenly solved without sufficient explanation. it might make a better action movie than a book. This probably should get 5 stars from me but I think it's become somewhat dated. One of the central plot points is a bit dissonant because more recent works have trained me to expect a reversal or twist and this didn't have it. Nevertheless, it was a very enjoyable book. Not quite as enjoyable as the first one, perhaps because it went from James Bond/ Wanted to the Mummy 3. Still, good sci fi. Sometimes..you want a simple, somewhat silly, book that is a quick read. And this hits all those points. There's zero depth, zero drama, but good fun. Gotta love a master spy/thief/nogoodnik who infiltrates intergalactic empires while sneaking in booze to avoid the DTs. Originally posted on SpecFic Junkie. This series is honestly my favorite skiffy series of all time. Our intrepid hero, Slippery Jim diGriz is at it again. He's hooked up with the beautiful Angelina who is due for twins and will stop at nothing to entwine him in nuptials. Unfortunately, said nuptials put him back on the grid and the Special Forces have a new assignment for him. There's a lot I'd hate in this book if it weren't written by Harry Harrison. But he's never taking himself seriously, so a Originally posted on SpecFic Junkie. There's a lot I'd hate in this book if it weren't written by Harry Harrison. But he's never taking himself seriously, so attitudes in the book never feel like they're his, even when they'd make sense for the era. The Special Forces have taken note of a planet that has started taking over other planets in the galaxy. Which doesn't make sense at all because everyone knows interstellar warfare just isn't feasible. It takes too many resources to make it profitable. So they throw the Stainless Steel Rat in undercover, to figure out how the Cliaandians are making the impossible possible. Stripped of all of his usual tools in order to get through the most detailed customs inspection he's ever faced, he has only his wits to rely on while trying to work his way through this grim, militaristic world. Naturally, he uncovers a conspiracy, a conspiracy he's not able to foil. But he is able to stop the Cliaandians... even if he isn't able to topple the whole problem. While Jim is undercover, he finds that the next planet for conquest is a resort planet that's ruled by women. Men are considered the "inferior" gender on this planet, and so treated. Normally, this trope really gets under my skin, but when it's done in a humor way, rather than a "look no really this is the way women are treated so let's make this an issue" way, which pretty much always fails, it's not nearly as troubling. And besides, it gives room for Angelina to throw even more barbs at her dear husband. Harry Harrison, 'the Monty Python of the spaceways' declares the Daily Telegraph on the back cover of this Stainless Steel Rat sequel. Well, that's somewhat wide of the mark, but they are ripping yarns. This one's a particularly strong episode in the series, I think, with our hero pitted against a genuinely formidable and sinister foe. And I don't mean his new wife, Angelina. Harrison walks a fine tightrope, managing to grant Jim wedded bliss while avoiding fully domesticating his Rat. In a simila Harry Harrison, 'the Monty Python of the spaceways' declares the Daily Telegraph on the back cover of this Stainless Steel Rat sequel. Well, that's somewhat wide of the mark, but they are ripping yarns. Harrison walks a fine tightrope, managing to grant Jim wedded bliss while avoiding fully domesticating his Rat. In a similar way, he has his cake and eats it with Angelina's rehabilitation - she's no longer a murderess, but somehow retains much of her murderous edge. They make a good team, enjoying a crime-spree honeymoon at the outset, but luckily Jim DiGriz still gets to operate as a lone agent as he's sent after some militaristic powermongers who are conquering planet after planet against the odds. The action zips along as niftily as ever and this time the seasoning has a little bit of grit to it, with some interesting reflection on how mortality and the absence of an afterlife affects Jim's morality, as well as the general impossibility of interplanetary conquest. (Not something the likes of Independence Day would ever pause to consider, but it is right at the core of the central mystery here - although once again it throws up continuity questions from the prequels, but - again - not this book's fault.) As DiGriz comes face to face with the real enemy, the 'Gray Men' who are using another planet's invasion force as their puppets, there's also a surprisingly brutal moment that almost seems to belong in a much darker thriller. But it wakes us up to the seriousness of the threat and ramps up the stakes very effectively. It's let down a little at the end, with everything a touch too easily resolved by a gadget and there's an odd hokey-cokey segment in the middle where Jim breaks into a military base, breaks back out the same day only to then break back in almost immediately. And, of course, when Angelina does turn up on the scene, Jim has someone who can conveniently bail him out when all other plans fail. But never mind. It's the usual entertaining mix with a sprinkling of some actual bona fide thought-provoking ideas and that chilling slap in the face that confirms the Gray Men as more than your average menace. And their origins are left intriguingly unrevealed, so the story ends with the promise for their possible return. “The Stainless Steel Rat's Revenge” is the second instalment in Harry Harrison’s light hearted science-fiction series, “The Stainless Steel Rat”. It follows on a few months after the end of the first book and continues the story of Slippery Jim diGriz. Jim is now married to Angelina, his nemesis from the first book now that the homicidal parts of her personality have been programmed out. Unfortunately, their holiday together is cut short when the Special Corps hunt them down and “offer” Jim the “The Stainless Steel Rat's Revenge” is the second instalment in Harry Harrison’s light hearted science-fiction series, “The Stainless Steel Rat”. It follows on a few months after the end of the first book and continues the story of Slippery Jim diGriz. Jim is now married to Angelina, his nemesis from the first book now that the homicidal parts of her personality have been programmed out. Unfortunately, their holiday together is cut short when the Special Corps hunt them down and “offer” Jim the opportunity to investigate a secretive planet that has been invading other worlds even though interplanetary invasion was believed to be impossible due to the huge level of effort involved. Once again Harrison gives us an enjoyable and humorous novel full of witty banter that kept me smiling from start to finish. Considering the pulpy feel of the novel it was also good to see that the writing is competent tight and the pace is quick without being too over the top. The only slight niggle is that overall the plot feels very similar to the previous novel and there isn’t really anything original added to the formula readers will be familiar with. In regards to the characters, well the loveable rogue diGriz shines through again here and I couldn’t help but enjoy following his escapades. The other characters do tend to be skimmed over and most of the enjoyment there is in regards to seeing the various cameos and actions of people we were introduced to in the previous novel. This book is quite simply all about diGriz. Overall, this was another humorous entry in “The Stainless Steel Rat” series. It follows the same mould as the previous novel so if you enjoy it then you should also enjoy this one as well. I do worry that in the long run the series could get a little bit too samey as the series progress but at this stage it is still entertaining enough. Having been a while since I’d enjoyed the exploits of criminal turned intergalactic secret agent James Bolivar “Slippery Jim” DiGriz, I picked up the second book in the series and wasn’t disappointed for doing so. Newly married, our intrepid hero is assigned the unenviable task of infiltrating a deeply militaristic society, which seems bent upon establishing a galactic empire. In true DiGriz fashion, it’s a fly by the seat of your pants operation that takes him deep into the workings of the inva Having been a while since I’d enjoyed the exploits of criminal turned intergalactic secret agent James Bolivar “Slippery Jim” DiGriz, I picked up the second book in the series and wasn’t disappointed for doing so. Newly married, our intrepid hero is assigned the unenviable task of infiltrating a deeply militaristic society, which seems bent upon establishing a galactic empire. In true DiGriz fashion, it’s a fly by the seat of your pants operation that takes him deep into the workings of the invasion and the conspiracy at its heart. Despite being delivered in Harry Harrison’s trademark snappy witty style that propels you through the protagonist’s exploits, the sequel felt rushed at points, and doesn’t actually conclude with this installment, so was a little subpar in comparison to the first book. That said, it’s still a lively story, and a great one for the commute given how short it is, definitely worth a read. Clearly the second installment of what turns out to be a rather longwinded series, this lacked some of the captivating pace of the first title. Despite this, the witty banter of our hero Jim is on par excellence, and we leave the title expecting to see more of the "grey men". 'I don't wish to bother you dearest,' says Jim to his wife busy with their twin s Clearly the second installment of what turns out to be a rather longwinded series, this lacked some of the captivating pace of the first title. Like the first book in this series, The Stainless Steel Rat, The Stainless Steel Rat's Revenge is a fun read. I never tire of Slippery Jim and can’t wait to turn each page to find out how he will get his way out of the next mess. And the neat thing about this character is…he always does it with style. Although the book is not very long, it is a must read for Science Fiction fans. Personally, I wish these books were longer. I would love to spend more time with all of the characters. The action ne Like the first book in this series, The Stainless Steel Rat, The Stainless Steel Rat's Revenge is a fun read. I never tire of Slippery Jim and can’t wait to turn each page to find out how he will get his way out of the next mess. And the neat thing about this character is…he always does it with style. Although the book is not very long, it is a must read for Science Fiction fans. Personally, I wish these books were longer. I would love to spend more time with all of the characters. The action never stops and there is never a dull moment. I consider this book a really fast read. I really liked this book and recommend this series to all readers. And for your young readers . . . 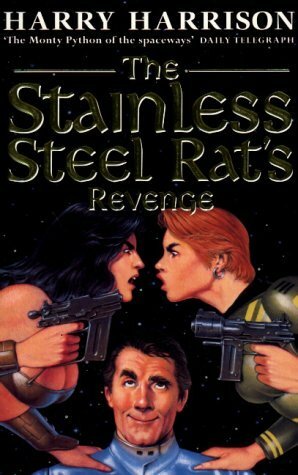 I would not hesitate to recommend The Stainless Steel Rat's Revenge. The violence is extremely minimal and the main character does not believe in killing. Гораздо слабее, чем первая (4) часть. Первая - легкая как перышко: космические корабли бороздят просторы средневековых королевств, роботы, работающие на угле и прекрасные незнакомки. Вторая - наоборот, натужный юморок над советским солдафоном - база Глупость, гостиница Злато-Злато и главный герой Васька Хулья. Ну ё-мое, Гарри. А феминистическое общество и матриархат? Хотя забавно он расправляется с Оруэллом и воплощает мощный план гибели военных империй. Оказывается нужно взорвать двигатели у вс Гораздо слабее, чем первая (4) часть. Первая - легкая как перышко: космические корабли бороздят просторы средневековых королевств, роботы, работающие на угле и прекрасные незнакомки. Вторая - наоборот, натужный юморок над советским солдафоном - база Глупость, гостиница Злато-Злато и главный герой Васька Хулья. Ну ё-мое, Гарри. А феминистическое общество и матриархат?